Melissa Fleming talks about her book A Hope More Powerful Than the Sea: One Refugee’s Incredible Story of Love, Loss, and Survival. 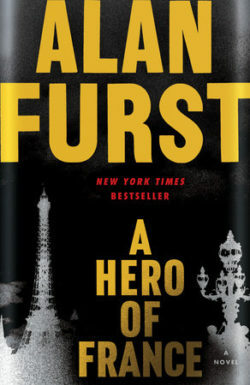 Then Alan Furst returns with a new thriller about the French Resistance during World War II. The book is A Hero of France. On March 6, 2017 Donald Trump re-instituted his travel ban on Muslim countries. Iraq was dropped from the list but Syria remained. While no Syrian refugees have ever carried out a terrorist attack in the US, they are fleeing terror and destruction in their own country: terror from bombs dropped by Russia, the US and their own government; destruction of their homes and communities by both government troops and the opposition. Some of those opposition forces are being supported by the US, despite their record of terrorism. So the Syrian refugees flee under terribly dangerous conditions. Already this year 2,000 refugees have drowned in the Mediterranean — and the year is just two months old. On this episode, we hear the story of Doaa Al Zamel, a young Syrian refugee who survived a harrowing journey across the Mediterranean Sea from Turkey to Italy. She was one of about 25 survivors out of 500 whose boat was deliberately attacked by smugglers. Her fiancé, the love of her life, did not survive. Dora floated in the sea for days carrying two babies in her arms, whose parents had handed them to her before they drowned. 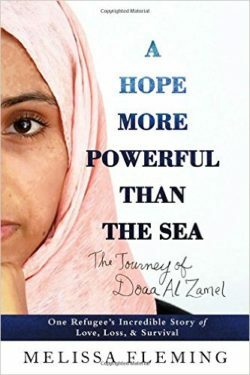 Doaa’s tale of incredible courage and heroism is told by Melissa Fleming in her book, A Hope More Powerful Than the Sea: One Refugee’s Incredible Story of Love, Loss, and Survival. Fleming is the chief spokesperson for the refugee agency of the UN, the UNHCR. Alan Furst has made a living writing terrific thrillers about Europe before and during World War II. His “Night Soldiers” series began in 1988; the latest in the series, A Hero of France, clocks in at number 14. It’s about the resistance networks in France that rescued downed British airmen and spirited them over the borders to neutral countries so they could go back to their bases in England. The book centers on one such network, run by the mysterious Mathieu, who confronts a series of unfortunate events in his fight to do his bit against the German military occupation. Grounded as it is in one historical moment, A Hero of France also has salience for our own time, as Americans see a growing threat of authoritarianism in our country and confront choices about risk and resistance. Francesca spoke with Alan Furst in his writing studio in Sag Harbor, NY about A Hero of France, his work and the relevance of the history in his fiction to the reality of today. Alan Furst is the author of fourteen novels in the “Night Soldiers” series and four earlier novels.